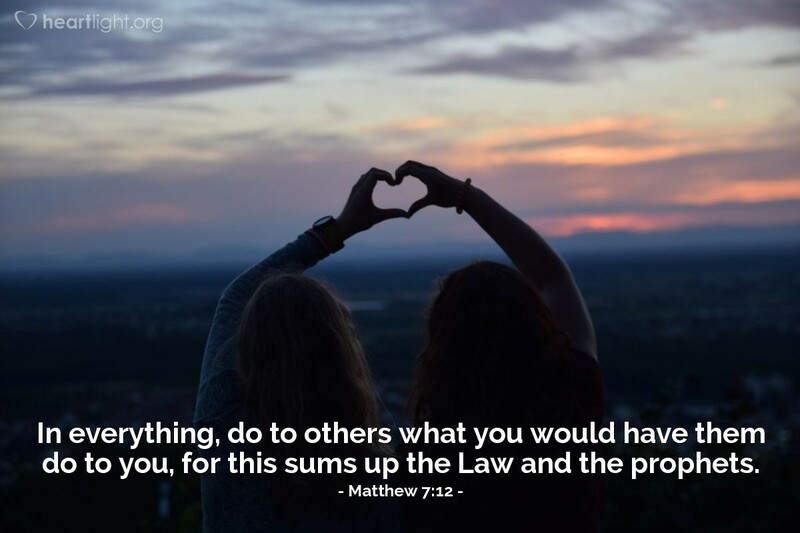 The Golden Rule — golden because it's genuine, lasting, and valuable. Imagine how different our world would be if we practiced this principle — not just in our "church life" but in our daily life: with our family, with our coworkers and employer, with the people we manage, with the folks on the freeway and in the neighborhoods where we drive, and toward the waiters and waitresses and others who serve us. What a wonderfully different world it would be if the Golden Rule were to be practiced. I think I'll start changing my world with it today! How about you? Generous Father, you have blessed me with so many rich and wonderful gifts. I can never ever adequately express to you the thanks you deserve. One thing I want you to know, dear Father, is that I especially appreciate the way you have treated me with grace and not with justice or judgment. Give me the power to do the same with the people my life touches this week. In Jesus' name I pray. Amen.